On New Year's Eve in 1999 ten-year old Amy Archer goes missing. Her parents, Beth and Brian, are shattered and the strain of not knowing what has happened to their daughter, coupled with the accusations of the press and public, leads to them splitting up. Now dealing with the ever present grief by herself, Beth is alone on the evening of the ten year anniversary of Amy's disappearance when she is contacted by two strangers; a young woman called Libby and her ten-year old daughter Esme, who not only looks like Amy's double but even claims she's Beth's missing daughter. While Beth is initially reluctant to accept their story, it doesn’t take much for her to believe them when Esme is able to provide private details about Amy's life that never made it into the press. Needless to say it is hard to digest for not only Beth but also the reader that Amy has really returned and what follows is a roller-coaster ride as the reader cannot help but mistrust everything that is written on the pages of the book until everyone and everything becomes suspect. The novel is greatly disturbing in parts (a necessity considering the topic it deals with) as it paints a horribly realistic picture of the details surrounding the disappearance of a child and the trauma the event leaves on those implicated. I was on the edge of my seat for the duration of this highly intriguing read and while the ending was not whole conclusive, leaving some things open to the imagination of the reader, it was certainly a satisfying one. 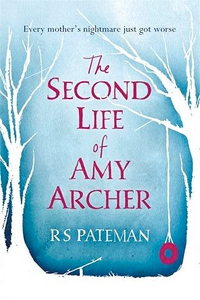 The Second Life of Amy Archer is a fantastic debut by author R.S. Pateman and right up there with recent acclaimed psychological thrillers Before I Go To Sleep by S.J. Watson and Gone Girl by Gillian Flynn; disturbing, gripping and suspenseful until the final page. Thanks a lot! I really couldn't ask for a better endorsement. I'm chuffed you enjoyed it so much and that you've taken the time to blog about it. You have helped calm my pre-publication nerves! You're very welcome! The review will be published to some other sites today as well which will hopefully help calm some of those pre-publication nerves (though really they're not necessary - it's a fantastic read! ).